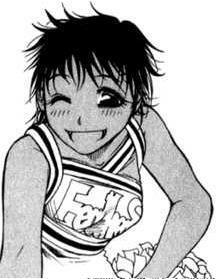 Maria is one of the Tenba High-School Cheerleading Club members. Cheerful and friendly, she is the only non-Japanese member in the club. She occasionally brings up certain traits of her Latino heritage, such as her way of dressing up for festivals and such. She holds the position of base when she performs with the other cheerleaders.